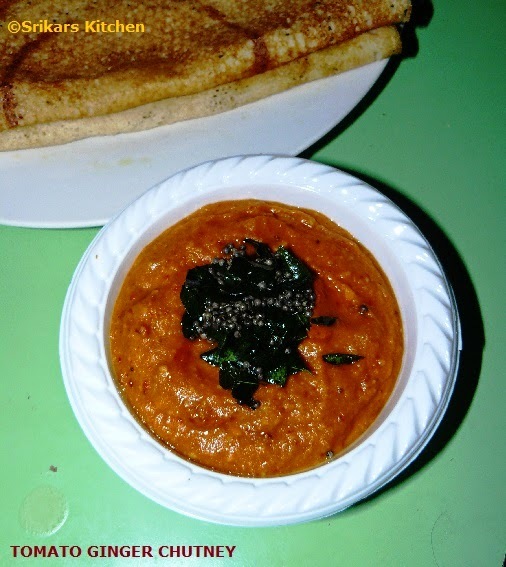 Tomato ginger chutney is tasty chutney & best combination of Idly & Dosa. Making this chutney without onion is good for some fasting days (fasting days garlic and onion is not allowed). Tomatoes tangy taste with ginger flavour is best of this chutney.I always prefer this chutney with hot Idly only. Heat one tbsp oil, add urad dal, whole red chillies & allow to saute. Add chopped tomatoes, ginger & allow to cook until it cooks well. Allow it to cool & grind it to a fine paste. Heat 2 tsp oil add mustard seed & allow to temper, add curry leaves & add to this chutney. Serve with Hot dosa, idly or roti.